New York Jets: The Luckiest Team in the NFL? The Detroit Lions have been deemed the unluckiest team in the NFL, so it’s only appropriate that we name the luckiest team as well. The New York Jets kicked off the seasonwith adisappointing loss at home to the Baltimore Ravens. But that didn’t stop them from fighting back to win their next few games, disarming the Patriots, Dolphins, Bills and Vikings. The interconference match up against the Packers didn’t fair so well for the Jets, with the Green Bay defense shutting down all attempts of getting near the end zone. With a 3-0 lead by the Packers in the third quarter, Mark Sanchez delivered the ball directly to Dustin Keller’s hands, which was quickly grabbed by the Packers and designated a fair interception by referees. if the Jets had challenges remaining, the call might have been overturned. The Packers defense continued to put up a strong fight, and the team scored an additional six points on field goals, taking a 9-0 win over the Jets. It’s no question the Jets have been playing solid football through the first few weeks of the season, but it’s the last three games that the team has been on the verge of losing and with perseverance and a bit of luck, have pulled through some exciting wins. In a back and forth scoring game against the Lions in Detroit, Sanchez managed to send the game into overtime with a 2-yard touchdown pass to Nate Burleson followed by a field goal kick by Nick Folk. After winning the coin toss Sanchez sent the ball down field 52-yards to Santonio Holmes putting them in field goal range. The Jets won the game by a narrow margin, 23-20. During Week 10 in Cleveland, the Jets barely pulled through again, and sealed the deal in overtime with a touchdown pass to Holmes. The Jets became the first team in NFL history to win back-to-back overtime games. As Week 11 rolled around, no one was expecting the Houston Texans to put up such a fight, rallying in the fourth quarter to overthrow the Jets 23-7 lead with a turnover and pummeling of their defense, taking control of the game at 27-23 with 55 seconds remaining. With New York fans on the edge of their seats, and only seconds to spare, Sanchez connected with Holmes on a 6-yard touchdown pass, winning the game 30-27. The Jets record could surely put them in the position of a Super Bowl team, but these last minute, fire drill offensive pushes to rescue the game have proven to be far too stressful for fans. It’s interesting to see that average prices for Jets tickets on the secondary market started to drop off around the Week 9 loss to the Packers. 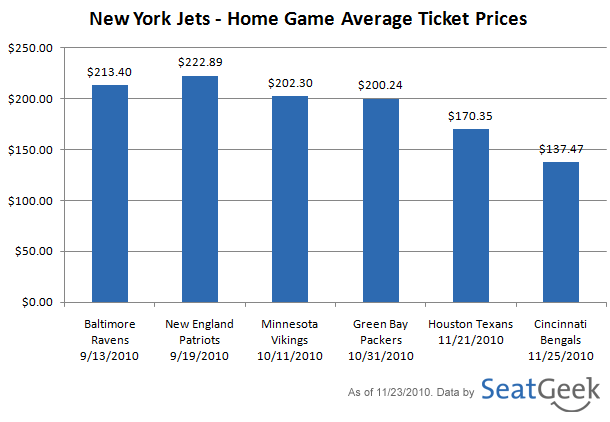 Here’s a breakdown of Jets ticket prices by home game, it’s interesting to note that they have dropped to #14 in our NFL Ticket Prices & Rankings, only four places up from the unluckiest team in the NFL, the Detroit Lions. Do the Jets have fair weather fans or have prices dropped due to lackluster rivals in the Texans and Bengals? It’s also interesting to note that tomorrow the Jets will play their first ever Thanksgiving Classic game, with prices trending well above the Lions, whose fans have been attending Thanksgiving games for years. 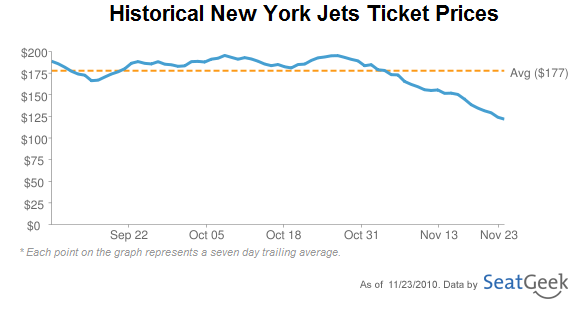 We’ll continue to monitor Jets fan sentiment and prices as the season unfolds. Are you a Jets fan, have you been stressed by the past three nail biters? Let us know in the comments or on Twitter @SeatGeek!